SIGNiX has announced the fall release of its industry-leading digital signature software, which features document delegation, push notifications, highly sophisticated integration options and enhanced electronic notary features. 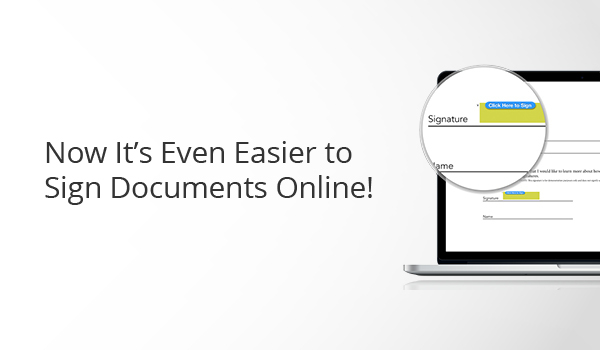 SIGNiX’s digital signature products make it easy for businesses to get documents signed online while maintaining regulatory compliance and necessary legal evidence. Submitters can now provide specific parties in a transaction the ability to delegate (forward) the signature step to a new party. All delegation events are carefully recorded and audited in the transactional audit trail. Controlling delegation occurs via Web Services API or the Document Wizard. If a party is allowed to delegate, the party will see an extra link in the initial notification email which can bring the party directly to a delegation screen. 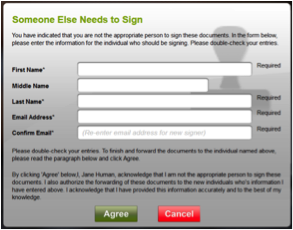 Parties can also quit the digital signature process and choose ‘Someone else needs to sign’ from a set of available exit options. NOTE: The delegation feature will be turned off by default for all clients to facilitate training and understanding of workflows. If your organization would like to take advantage of this new delegation feature, please contact your SIGNiX representative. SIGNiX now offers significantly deeper integration and customization than ever before, allowing clients to embed and control aspects of the SIGNiX document preparation, wizard and transaction control user interfaces directly. In other words, clients will be able to create their own document preparation and transaction status screens where the end user has no visible indication they are transitioning between the client’s application and SIGNiX. Allows control of the MyDoX interface (the tabs in the document preparation Wizard) securely from the client application (where SIGNiX would be inside an iFrame) providing for a more seamless user experience. Allows programmatic editing of in-flight transactions (adding parties and documents to an existing transaction from a client’s application, rather than through the UI). For more information on this new feature, please stay tuned to signix.com/blog or contact your SIGNiX representative. SIGNiX can now offer bulk, invisible certifying digital signatures via Web Services API on submitted PDF documents to provide tamper-evidence and document integrity controls independent of signer identity. SIGNiX now supports push notification events via Web Services to proactively notify integrated clients that a transaction is complete, eliminating the need for server-to-server polling. This function is now available from every view within the Document Center, as opposed to the ‘Transaction Templates’ screen only. If you haven’t yet added parties or documents within a transaction yet, dialogs will now automatically pop up, eliminating the need to click the Add Party or Add Document button. Additional button clicks have also been eliminated from the Add Document process, meaning users can immediately add a document from their file system after selecting Add Document. Back by popular demand! Date fields are now automatically added alongside signatures when dragged-and-dropped onto a document in the document Wizard. Dates can be easily deleted if necessary by clicking on the X above the date or the calendar icon above the signature. CC / Distribution List File Attachments. Files are now sent as separate PDF file attachments to the email as opposed to a ZIP file to improve experience on mobile devices. Draw Your Signature. Pen width increased to aid visibility of signature in smaller fields. Updated Please Wait Graphic. A nicer looking waiting graphic has been added. Updated Logos. New SIGNiX logos throughout…enjoy! Added Email to displayed fields in Add Party and Transaction Status. Implemented identity re-use. Signing PINs can now be re-used by all signing parties, regardless of authentication, eliminating the need to re-create PINs for multiple transactions. New webpage created to help users understand SIGNiX-signed documents. Visit www.signix.com/viewing for more information. Implemented updated version of PDF rendering engine. Various non-essential user interface elements fixed or improved. Numerous small bugs and errors resolved. *The new Preview Signature function is a simulation of font placement to assist users in placement and sizing of signature fields. It uses one of the standard fonts. If a user uses a different font or chooses to draw their signature, it may affect the ultimate placement of the signature. Note that screenshots in this release note are taken from the beta version of the release and thus may be different in the production release.